New Directions in Live Sound -- Put it All Behind You. Bose L1 Model II systems deliver wide horizontal sound coverage and smooth tonal balance across the stage and throughout the room. And they're lighter and more compact than ever. Like the original, award-winning Bose L1 system, the Model II sound system is an all-in-one innovation that replaces conventional monitors, mixers and PA speakers. And this professional sound system is packed with proprietary Bose technologies designed to improve your amplified sound. This premium sound system for musicians combines the L1 Model II system and T1 ToneMatch audio engine. This professional sound system provides wide coverage, smooth tonal balance and a suite of studio-class effects and tone-shaping tools. And it's packed with proprietary Bose technologies designed to improve your amplified sound. Just bought my second L1 Model II so I don't have to cart PA to and from Mexico each winter. My first one impressed me to no end, sweet tone, amazing coverage and a total back saver. I play about 150 gigs per year and after 3 years, it's still minty clan and totally reliable. I play mostly solo and it's more than what I need but like the extra horsepower should I want to work at on another band project. One place where this unit shines is with my Porchboard Micro. I play through a lot of PA's and most don't have the low end bass response and clip out. The Bose takes it and it runs it into this thick, luscious bass that fills the low end magically. Best PA in existence! With the Bose behind me I hear exactly what the audience heard and it sounds good. The audience loves me. I love myself. I purchased this system in July of 2015 after using an L1 system at a pub I regularly play at. After I played through it the first time, I knew I had to invest in one for myself. I picked up the package with the B1 bass unit because I'm a solo musician who plays the acoustic guitar and mandolin + vocals, so the B2 bass wasn't required. As of today, I still can't say anything bad about the system. The set up is extremely fast, the sound is so clear and the coverage is huge. In between my sets I use my iPod to fill the space and the audio sound is equally great. I'm generally playing in small to mid size venues, but I have used this in open spaces for wedding ceremonies and the sound coverage was still quite impressive without an enclosed space to keep the sound in. I also love bringing the system out at the cottage to blast the tunes for get togethers. The Tonematch engine is also a great little unit that I have no complaints about. I'm also constantly being told how good the sound is when I play after sets. It was very noticeable how much better the L1's sound is when I played at a private charity event in an medium sized open space dance area. I set up and played my 3 hours on one side of the room, and a second act with two performers followed me directly across from my location on the other side of the room. They began to play as soon as I ended and compared to my system, they were completely muffled; especially vocals. Individuals at the event were coming over to me while I was packing up and commenting how my sound was far better. It's been a solid year and a half using this system, and I hope it continues to perform like this for a long, long time. I'm really hoping for good durability with proper care of this system. I own two of these systems. We play in configurations up to a 5 piece band. This is by far the fastest plug and play quality sound you can get. I would recommend this to anyone who plays an instrument and sings! We use this as a FOH PA System and it has consistently worked awesome and sounds great. We have a classic Rock band and a Rush Tribute Band and the L1 gets us rave reviews.Bar owners look at us setting up and wonder if we are going to have a full sound.. then they ask "What is that stick where all the music is coming from?" We rune drums Bass (Mic'd amp) guitar and vocals through the L1 and it sounds great. People know the music is loud yet the sound quality is so good they don't complain. Don't run your bass guitar direct or your Electric guitar direct through a Line 6 Vox pedal board etc..mic the amp for the best results. 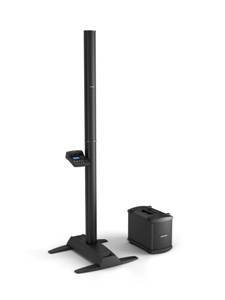 Feedback does become a problem if your using any vocal processing and put the Bose L1 behind you.Reliable, easy to transport and set up no lifting heavy PA Speakers on Stands.Expensive but worth every penny! I bought mine in the Ottawa store. From the moment I tried it in the store, I knew it was for me. The portability and quality is what sold me. From the Honda Fit to the stage... set up in 15 minutes. Ready to play. Incredable sound quality. No regrets... none. this is the best system I've ever owned. The comments I receive are "amazing sound" "where's the sound coming from?" and could you please turn down the stove? I can usually set this up in 10 minutes and the sound still amazes me when I walk around the room only to find that there are no sweet spots in the sound as with most systems. Tone match..awesome!! great all around system for small to medium application, when are the new more powerfull systems coming out, any ideas? everywhere I perform people are amazed by the sound of the bose system.....many come up to the stage looking for the speakers and are surprised to find out the post behind me is the system.....clarity, quality, and smooth sound that spreads out to every corner of the room, even through walls......been waiting a long time for a p.a like this......great job bose!!!! I bought my first one from the Markham store in October 2010. Bought the second one just a short while ago (June 2011). Obviously I loved the first one enough to buy a second. I actually got rid of my Boogie Mark V to buy it, I love the sound of my HD500 direct into the L1 that I have no need anymore for a traditional guitar amp. I can easily use these two systems to play bars with my rock bands, easily handling my electric guitar, accoustic guitar and all the vocals. I have 2 B1's per system and another B1 on order, I already own the packlite so I will have a lot of flexibility for different settings and needs. The best sound system I have ever experienced. Portable, manageable, easy to assemble and quick to assemble. Loved it. Picked up 2 at the Burlington store with 2 B1's each. Also 2 extra B1's and packlite amp. They are the best sounding speakers I have ever owned. Vocals are great, bass is awesome , guitar is amazing anything you put through these things sound fantastic without much tweaking. I am looking to get a third system and this will cover all my needs for live band application, Dj, party's whatever. I would higly recommmend them. Bose L1 portable line array systems. PA and Monitors. Combined.